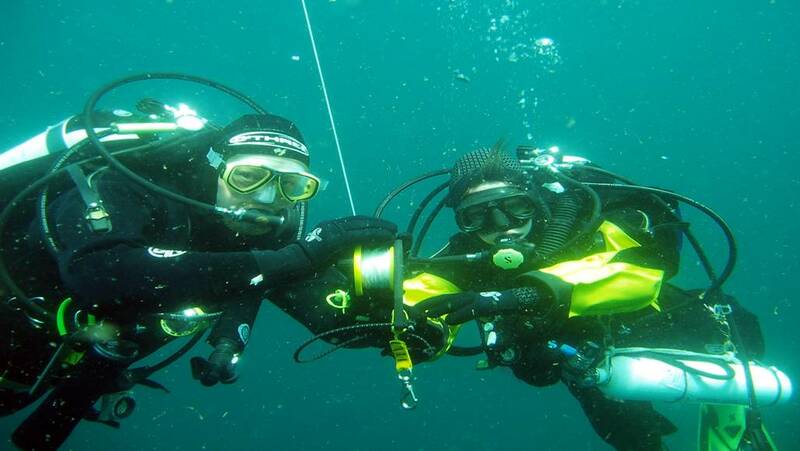 The term mixed teams is broadly understood as a team of divers in different equipment configurations. Typically this is a team of divers where one or more divers is in open circuit equipment and the other team members are in CCRs. Given the great difference in how divers are trained in open circuit versus a CCR, PADI does not sanction training divers in open circuit and CCRs together. However, PADI does allow for Tec Instructors to conduct PADI Tec programs with divers in both backmount and sidemount equipment. While there are a couple of challenges of teaching PADI Tec course with a mixed team, there are also some advantages to a mixed team of backmount and sidemount divers. One challenge is demonstrations. PADI Tec programs require a demonstration in both confined water and open water dive, in essence from start to finish. There are a few skills such as valve shut downs, in particular the isolator valve, that differ between backmount and sidemount. The easiest way to accommodate this with a mixed team is to have a Certified Assistant who is certified as a sidemount diver in either backmount or sidemount. For those few skills that are different, the assistant under the instructor’s supervision can demonstrate those skills. This approach is consistent with PADI recreational programs where PADI Divemasters or Assistant Instructors demonstrate skills such as air sharing where the assistant may have an AIR 2 configuration and the instructor has a standard octopus. Provided the instructor is supervising the assistant’s demonstrations, there is no violation of PADI Training standards and insures that the students are seeing role model demonstrations. Another small disadvantage of a mixed team is the instructor will need to spend some additional time during class sessions and practical application sessions covering some of the differences of how the equipment is configured, assembled. Yet, even these disadvantages have positives to them. By allowing your assistant to conduct some of the demos, this allows him or her to keep their own skills sharp as well as having the opportunity to more fully participate in the course which is great experience if they go on to become instructors. In addition, the extra time you spend on working with students in both equipment configurations is great exposure for the students as they have the opportunity to see a different equipment configuration. Another advantage of a backmount sidemount team is it gives the instructor greater flexibility with students. A good example is the author of this article. I suffered an injury to my right shoulder and had to undergo surgery. This has created a situation where I am unable to reach back enough to turn off the right post in a backmount configuration so I have switched to sidemount. There are others who have similar issues or problems with their back, but the instructor now has the option of having those students in sidemount. Whether the instructor chooses to have their students in the same configuration or in a mixed team, the PADI Tec programs are designed to allow for either. Effective immediately, the DSAT TecRec courses, Tec Deep, Tec Trimix and Discover Tec, may be conducted using a sidemount equipment configuration. This also applies to the PADI Tec Basics Distinctive Specialty. To conduct the course in sidemount, DSAT Tec Deep or Tec Trimix Instructors must either show proof of a Sidemount Instructor certification through the PADI Distinctive Specialty program or hold a qualifying instructor certification from another organization. In addition, DSAT Instructors must obtain a copy of the Sidemount Instructor Guide to use as an addendum to the DSAT Instructor Guides for each respective course. This now applies to Tec 40, 45 & 50 as well. If teaching these courses in sidemount you won’t need the addendum because the information is integrated into the course outline in the instructor guide. Hi Steve, good article. My suggestion is: make all sidemount divers! :). This the first of a series of videos, to help show what sidemount diving is all about.